Everyday is a hollandaise when you are in ketosis! One of my favorite breakfasts is any kind of eggs benedict. I search far and wide for the most creative variations in my area and love finding new spots that can pull this off with precision and not disappoint. There is a lot of timing and attention to detail when making a good eggs bene – so much can go wrong. The recipe below you may want to file under “weekend breakfasts” as it is a bit involved, will make a mess of the kitchen but be sooooo worth it in the end. Locally, there are a few hot spots that have their act together on this front. 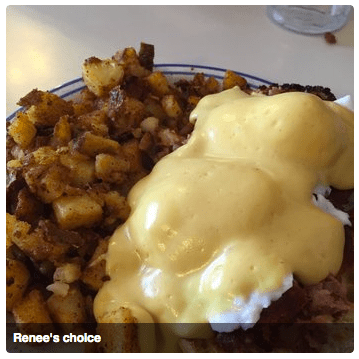 My absolute favorite is in Granby CT, a place called Dave’s Restaurant that makes their own corned-beef hash bene – “Renee’s Choice”, that will satisfy you until diner time. If I am visiting Dave’s I am clearly planning to go off the Keto-rails for the day as the home fries are crisp and I’m not gonna pass up this once in a while treat and make any edits to Dave’s breakfast masterpiece. This is one of the challenges with my new keto-lifestyle as my only option for eggs benedict when eating breakfast out is to lay low on the potatoes and don’t eat the english muffin that most all eggs benedicts consist of. I have done it but it’s not usually the best way to go. I had always thought is it was the decadent hollandaise on my breakfast of choice that was keeping me fat all those years. Come to find out it was the muffin and potatoes keeping my waist at max density all along! Every once in a while you can find an amazing crab-cake eggs benedict that needs no muffin as the base. Problem solved! This breakfast will rival any you find out and about – will impress your crew any weekend morning at home and you won’t need a nap afterwards. Be sure to plan some activities afterwards as this is a hearty meal that you will want to work off with all that extra energy you will have. In a large bowl, mix together all ingredients, except for the flour and oil. Shape into patties and dust with almond flour. Carefully place crab cakes, in batches in pan and fry until browned about 5 minutes each side. Stir water to create a vortex. Add eggs one at a time to circulating water. Cover and turn off the heat. Set timer for 4 minutes. Melt butter and set aside - keep warm. In a small pan combine all other ingredients and wisk together over med heat. Slowly drizzle in melted butter while wisking until thickened. Top each crab cake with a poached egg. Timing is key for success - keep the crab cakes plated and warm in the oven as you make the eggs and hollandaise at the same time. My first Zucchini Carbonara was a huge hit. One of the great surprises for me of this ketogenic lifestyle is the complete reversal of things, that in the past were clearly bad for you, now with a few tweaks becoming health foods. Zucchini Carbonara is one of those happy surprises. In the past Carbonara was a decadent dish you could only order a few times a year and only at special locations that perfected the dish and only if you had a strong heart. 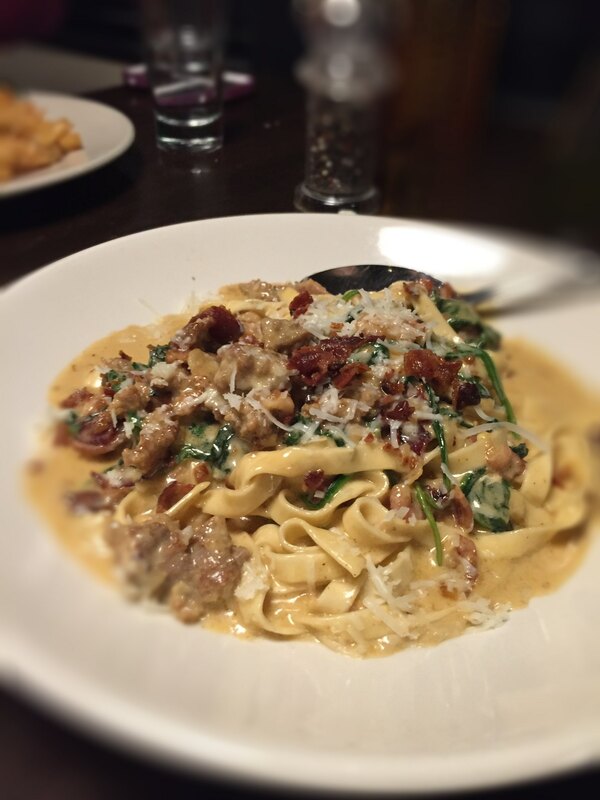 Carbone’s in Bloomfield is our favorite spot for to-die-for Carbonara – my daughter Brynn’s favorite dish. She’s 12 and weighs in at about 75 lbs. soaking wet so there is always extra bites of Carbonara that my wife and I sample until we are both off the keto rails. See exibit A! As a stocking stuffer I received my first veggie-spiral-slicer for making zucchini noodles and other veggie / pasta like substitutions. After blowing out of ketosis on our last visit to Carbone’s I decided to give the spiral slicer a go – I mean everything else in the dish is keto-friendly so why not add this to our weekly possibility of menu items. Pair this with a glass of Tuscan red wine and you will be transported to another land. Put a large pot of salted water on and bring to a boil. In a large skillet heat the oil. Add the pancetta and cook over med heat until most of the fat is rendered, 7 minutes or so. Add the mushrooms and cook for 3 minutes. Add the shallot and garlic and cook for 1 minute. Cook the zucchini noodles in the boiling water for 4 minutes. Add the cream and simmer over med heat until thickened, about 2 minutes. Add the hot noodles to the skillet and stir to coat. Remove from heat. Stir in the cheeses - reserve some for later. Stir in the egg yolks. Sprinkle with parsley and fresh ground pepper. Serve with reserved cheese for the table. If you need more liquid in the sauce you can add a little of the pasta (zucchini) water. You can also add 1 sweet italian sausage patty when you are rendering the pancetta if you want to kick this up a notch! I have been making this pork chop recipe all of my life. Some of the best recipes we always seem to come back to become standard choices for a quick weeknight, crank-it-out dinner solution. This easy pork chop recipe I learned from a family friend when I was 10 years old. Been making pork chops this way ever since. Pork chops are generally pretty cheap which make this a really affordable option that is low in carbs but big on taste. Every once in a while we splurge and go for a better quality locally raised pork chop that is a completely different breed all together. The pasture-raised, Berkshire Pork from Green Valley Farm in Eastford, CT is worth the extra dollars – you have not tasted good pork unless you have tried some from here. And… they ship anywhere! Back to my youth! The cut of pork chop does not really matter so much as this recipe will elevate any variety. The key to grilling pork so that it does not dry out is to make sure of a few things. Be sure the pork chops are at room temp before you grill. Make sure the grill is very hot when you place the chops – makes for great grill marks. Immediately turn down the heat to low-med so the chops cook slow. Pork chops that cook too fast will dry out easily and no one likes a dry pork chop. As a kid growing up in NY I was fortunate to have a gas oven with a salamander broiler so the results broiling these pork chops under a flame was impressive. It’s just a few ingredients so I hope you will try this soon and report back. My favorite pork chop recipe since I was 10. 3 tbs. soy sauce or tamari sauce for those gluten free folks. Fresh ground salt and pepper. Take out pork chops ahead so they are at room temperature. Grind fresh pepper on both sides of pork chops - lightly salt as well. Spread mustard over both sides of pork chops. Shake soy sauce over pork chops. Using a fork, mop one pork chop on another until yellow mustard and soy sauce turns a little brown and are well coated. Place pork chops on hot grill - drizzle with any extra sauce from the plate. Turn down grill to med-low. Turn chops a quarter turn after 4 minutes. Turn chops over after another 4 minutes. Cook until done another 6-8 minutes. Serve hot off the grill. Subscribe to our EverydayKetoGourmet newsletter - get fresh low-carb recipes delivered to your inbox. It's FREE! Hello - I'm Adam, wellness enthusiast, tennis player, networker, father of two amazing daughters and food lover. I fill these pages with healthy low carb and keto-friendly recipes, food finds and rants on living lighter in a carb-filled world. Love People. Cook them tasty food! SAVE 20% on Holiday Cards from Lady Jae. Save 10% on your first FBOMB order!